Improving the speed and reducing the cost of information and discovery management are our passion. We are experts in information governance. Morae Global’s professionals have the vision, experience, skills and knowledge of technology and operations to deliver at the highest legal levels of service throughout the entire information life cycle including electronic discovery, governance and records compliance, providing clear and measurable quality and metrics. Challenging the typical EDRM-based linear approach, our professionals rely on early analytics, streamlining document reviews and minimizing required resources throughout the project. Our methodology is designed to leverage predictive coding and other analytical tools to minimize volume, cycle time and cost while increasing measurable quality. Our professionals develop strategies based on particular experiences using tried-and-tested technologies, resulting in custom, cost-effective solutions and optimum performance. Constructing an information governance program that integrates information management and discovery can greatly reduce cost and risk, while generating positive outcomes for the business. Our deep experience and principled belief in such integration uniquely position us to conduct holistic assessments of your information governance and discovery programs. Our team of seasoned professionals draws upon our expertise to analyze your current state of operations, develop or adjust strategic direction and identify areas of improvement. We deliver a set of tools and actionable plans to implement cost-effective and practical solutions to transform your information governance and discovery programs and position them for sustainable growth and success. Effective information and discovery management requires the establishment of appropriate policies, standards and procedures governing how information is managed throughout its life cycle and to support discovery-related events. Our information governance and discovery experts work with your legal, records and information management, IT and business stakeholders to define business needs and develop foundational documents to ensure compliance with regulatory retention, privacy and confidentiality requirements as well as legal obligations arising from litigation and investigations. Beyond just policy design, our experts help define and establish the governing model and protocols used to apply, monitor and enforce consistent application of all policies across the organization. 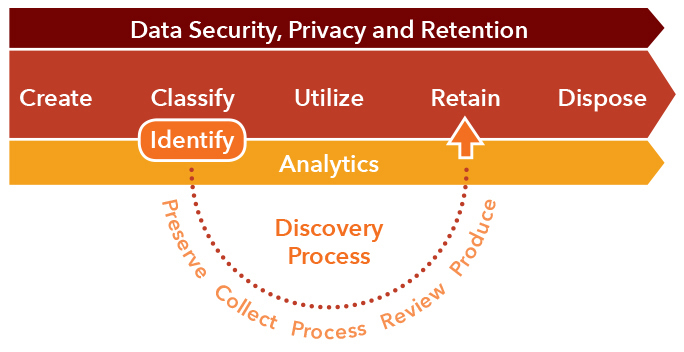 A well-planned data classification system improves access to information and supports compliance requirements for data privacy, security and retention. It also streamlines downstream discovery identification and preservation efforts. While the value and need for classification are understood in most organizations, its application often falls short because users are relied on to manually classify information, which is time-consuming and burdensome. We solve this shortcoming by automating classification through integrating data analytics and machine learning within business processes. Our analytics specialists and information management experts work together to help organizations achieve higher levels of information life cycle management at scale across the enterprise. While the continuing decline in data storage costs frequently allows organizations to avoid the challenging process of data disposition, the result is typically increased discovery costs and associated risk. An effective defensible disposition process mitigates such costs and risk and supports efficient business operations. Morae Global works with your team to develop and implement defensible disposition strategies. Our methodologies ensure tight alignment with information governance and legal hold processes and position your organization to monitor and measure successful adoption. The results are reduced data storage and discovery costs, improved compliance with regulatory mandates and efficiency from eliminating obsolete and redundant information. Most organizations have large quantities of legacy data stored on file shares or email servers, in antiquated systems and in a multitude of other locations. This data often has little ongoing value to the business, is costly to retain and creates organizational risk. Whether trying to decommission an obsolete system or clean up an evidence repository, the data must be reconciled and validated against legal and business requirements. We have established a practical and defensible approach to legacy data remediation that addresses legal obligations and business needs. It leverages advanced data analytics technologies to streamline validation efforts and enable informed disposition decisions. Ongoing monitoring is necessary to maintain defensibility and inform opportunities for continuous improvement. Our professionals possess deep expertise implementing compliance programs, tools and reporting metrics that enable organizations to proactively monitor and measure their information governance and discovery functions. Our approach focuses not only on proactive monitoring but also on managing compliance deviations to ensure your program is evolving and aligned with your operations. The result is a 360-degree program that includes a defined post-implementation review, improvement processes and corrective action plans. The success of any project is in no small part measured by its degree of organizational acceptance, which is in turn dependent upon successful change management. Change management is not just a set of tasks; it is a discipline unto itself. Our experience working within and across numerous organizations and industries uniquely positions us to guide and assist in instituting new information governance and discovery policies, procedures and technologies. Our change management experts work with your project leadership to assess organizational readiness, design tailored change management plans to socialize the change and inform key stakeholders of new benefits, provide training and education and support those affected by the implementation. The process facilitates a high level of adoption with a minimum disruption to existing business operations.